Doing okay UshnishDa. Pujor onek shubhechha tomader ke. Absolutely adore your hing er kochuri, I might try over the weekend. Thank you soooo much for making me remember all the good things of life. and oh yes, hinger kochuri is a perennial favorite at home. maybe the only recipe in your website which I wont have to follow. :) will try the aloor torkari though - it sounds very interesting. Ha, ha, laughing away at "ukune buri". It is one of the stories my Mother tells my daughters too. My neighbor friends would get Shuktara and we would exchange. You draw a beautiful picture with your words. Ami sposhto dekhte pelam ekta frock pora meye, baalish kole Pujo barshiki Anandomela porchhey! I bought your book with this anticipation. Jodio ami India-te thaki tobe Kolkataei noi. Amar chhele meye keu ei Bangla portey pare na! Its a pity I cannot share these things with her. Hinger Kochuri-ta also looks temrting enough to try. U have really tempted me with the hinger kochuri will be making it real soon. What a lovely memory rush! Like all Bongs, this is THE time of the year most awaited and counted-down-to. Baba and my birthdays also fall this time, making it all the more special. We always grew up outside Cal, so can totally identify with the feverish wait for the Pujobarshiki! 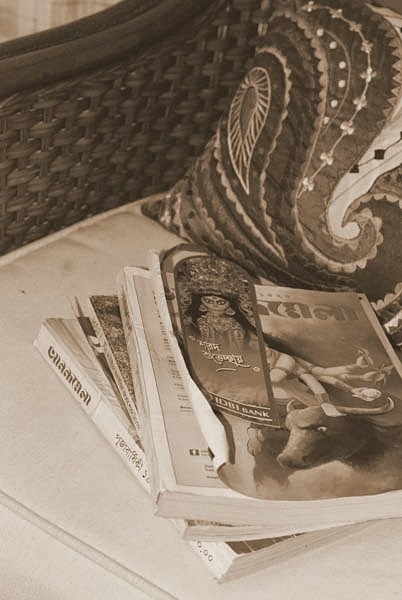 Infact for the longest time, I had no interest in the Pujo jama-juto shopping, I was super happy being left alone with my Pujobarshiki. Once we moved to Delhi, I discovered the joys of shopping :P Growing up with an-almost-same-age sister meant we both had two new sets of dresses everytime. It was always more fun the day after Pujo shopping to pore over all the new dresses yet again and make lists of kondin-konta-porbo. The recipe looks yummy, to say the least. Dokhhineshor'er stall gulo mone pore gelo!!! I'll probably try the alur torkari aajkei! Though lazy lazy me will never ever gather the courage to make the kochuris at home, I'll just wait for the CR Park visits :D Totally agree portion control is criminal on deep fried goodies come what may haha. Namaste Sandeepa, This Heenger kachuri with alu is my all time favorite food. I was born & raised in Uttar pradesh (all over it) & I believe the only two odors emenating from my body are the smell of heeg & the smell of kerosene (that's a story for another time). I see that you experienced that when you fry the dal pithi after the baghar, it sticks to the karahi like crazy. 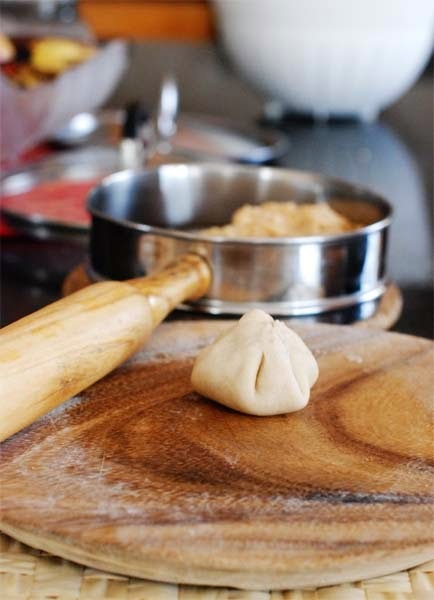 I learnt this little sneaky trick from a very elderly relative: whenever you have to fry a dal pithi, like for kachori here, or for moong dal halwa, or for the urad dal pinni ( the Urad dal laddu Punjabi style), DO NOT HEAT THE GHEE or oil. If using ghee, melt it over super low flame so that it just melts, does not get heated up (if it does get heated, turn off the heat & wait for it to come to room temperature).The same for oil: let the baghar cool to room temp. The add the dal paste & stir to mix for a couple of minutes. And then turn the heat on & proceed as you do. Viola! 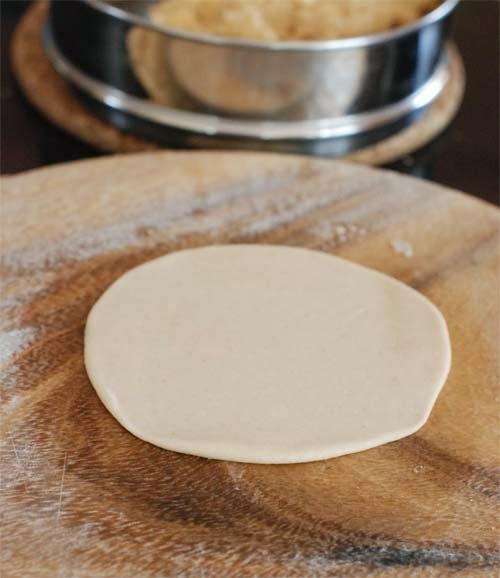 No more dal paste sticking to the pan...I have never used non-stick or aluminum stuff in my house, using this method, I have never had the dal paste sticking to the bottom of the pan. Ohh, that is such a great tip. Will try that next time and update the post. 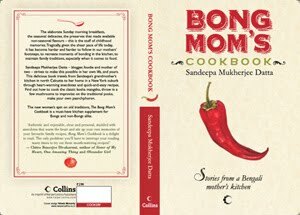 Thanks to your mom Sandeepa, Anandomela probably set you on your current writing career and we all the richer for it. 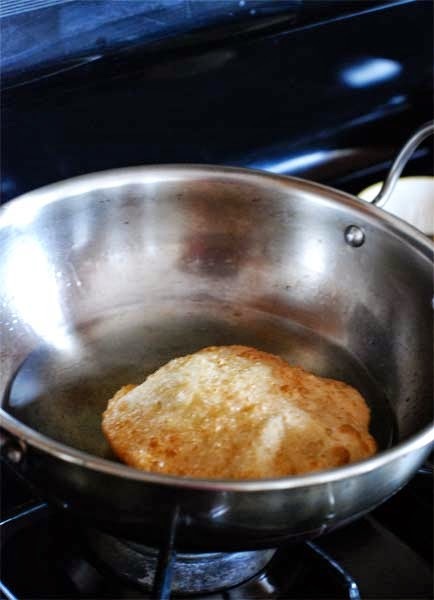 As for the deep fried stuff I made poori and masaal this weekend - perhaps the last of the fried goodies the family will get till Spring. Why, because you do it outside ? I got a fryer too recently but have not fried poori in there. We fried fish and veg & keema croquettes. But can't you do it in the basement ? 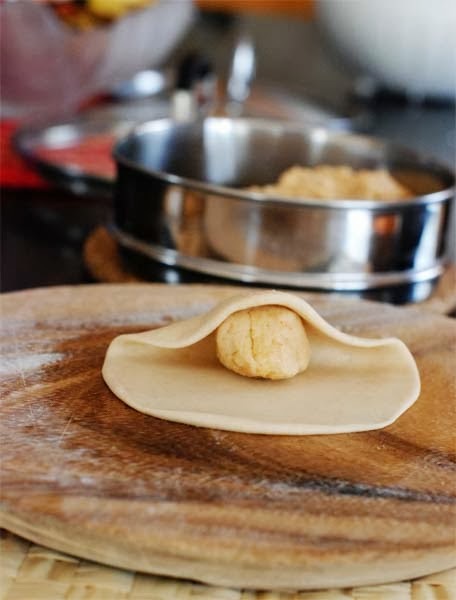 Your mail came just in time....today's Mahalya and I am going to make just that...luchi and aloor torkari with halwa...on second thoughts, i may switch to your hinger kochuri...sounds delicious!!!! Hope my urad dal soaks for good during the day time too!!! I am like that too- I get very nervous about deep frying- huge mental block. I have no problem if somebody else is doing the frying..lol. Time to make kachuris I see. We used to get Deepavali special issues too, I don't remember whether the kids' magazines had them but the other mags did, they were much coveted for their size, writers, stories and cartoons. I like the pic you painted of waiting for the mags - really, we didn't have much else to do but read and play, in those days. I feel sad kids don't have that now. 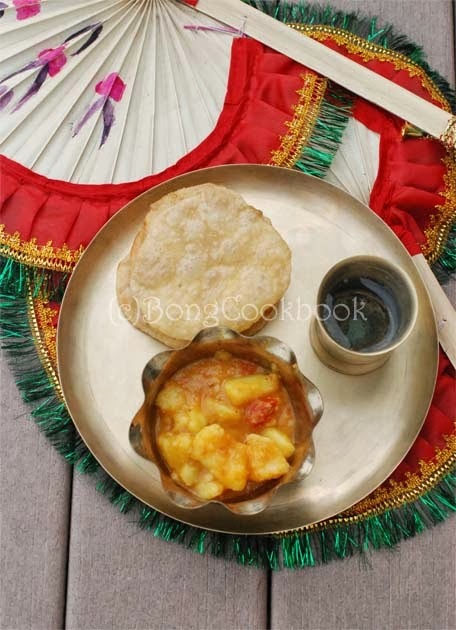 Was it a conscious decision on your part to remove the "Dhokar Dalna" recipe from your blog? Or I am having trouble in loading the page at my end. I made it yesterday and it was awesome :), Thank you for this awesome recipe. God bless you!! Such a great great treat Sandeepa. Tomader pujo khub bhalo katuk. Lots of love to LS and BS. I prepared alu'r tarkari for Lakshmi puja last week and it came out very yummy just like the kolkata Putiram's alu'r tarkari I used to enjoy during my college days, brought back memories! Lips smakcing delicious. Thanks for your recipes. Eyi post ta miss kore gechi. Pujo'r shomoye ebaare khub easily pujo shonkha pelam ar baare baare tomar kotha mone porchilo kintu osustho thakar jonne ar jiggesh kore utha hoyeni. Diwali te onek kochuri khawa holo ebar Rajasthane ... haath pakha gulo ki shundor!